Have you ever noticed some uncommon characters while editing a document in Microsoft Word? These are the characters that sometimes confuse users. But they can help determine the layout of the document. Some steps to show the formatting marks are listed below. 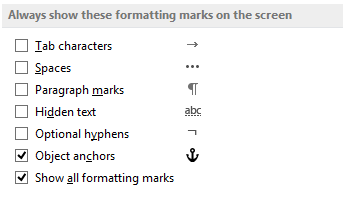 What are the different types of formatting marks that can be revealed in a word document? With the help of show or hide tool in Word 2013, you will be able to reveal some of the marks like spaces, hidden text, paragraph symbols, optional hyphens, page breaks, tab characters, etc. Some of these marks are shown by default while some of them are hidden. If you would like to show all the marks in a specific document then you must follow the steps that have been discussed below. After clicking on the "Word Options" button, click Display tab. Under the "Always show these formatting marks on the screen" section, select the marks that you wish to display. If you are considering showing all the marks of formatting then you must check the box beside the "Show all formatting marks' option. Or you can check the different options. You will also be able to show the paragraph marks using the default settings. Open the word document on your computer. Click on the "Home" tab on the specific document. If you wish to show the paragraph marks on the word document then you must click on the "Show/Hide" button in the Paragraph section of the "Home" tab. There is also a keyboard shortcut, Ctrl+*. You can also show the squiggly lines for grammar and spelling on your document by following the steps discussed below. Open the specific word document on your computer. Then you need to go to "Word Options" tab and click on the "Proofing". Under the "When correcting spelling and grammar in word" section, check the box beside "Check spelling as you type" and "Make grammar errors as you type"